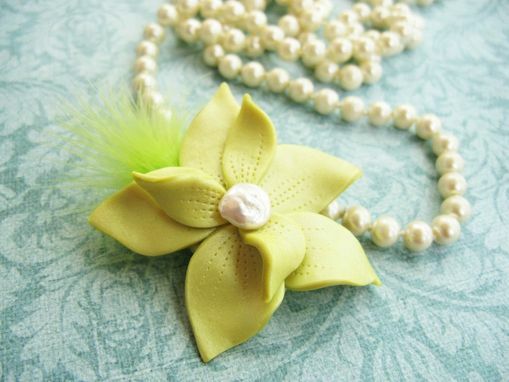 This unique piece is carefully handcrafted in polymer clay and adorned with an authentic freshwater pearl and colorful feathers. The coolest thing is that is has a brooch back so you can wear it on pretty much anything! Its a super cute and feminine way to accessorize even the simplest looks! We can make them for your bridal party at discounted price, just contact us and we'll talk about it! This listing is for one brooch. It does not include any other accessories.